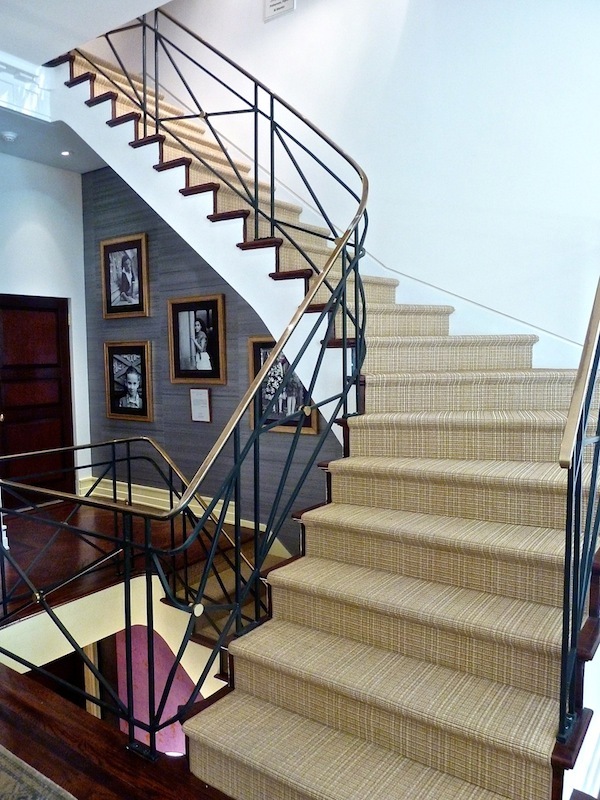 Finishing off the main floor at the Kips Bay Decorator Show House is James Huniford‘s dramatic atrium. With the feel of an artist’s studio, Huniford included a creative mix of antique and custom furniture, art and accessories. 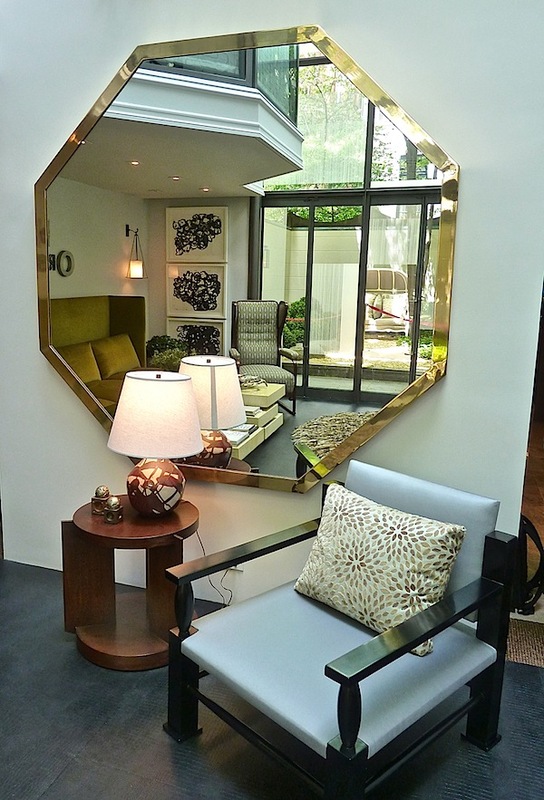 In the stunning Maison Jansen brass mirror from Bernd Goeckler, you can see the double story windows and overhang connecting the room to both the garden and other interior spaces. The geometric angularity effortlessly connects a lacquered wood Jacques Quinet chair from 1949 with the mirror and the Huniford Collection oak side table. Another successful mix of eras is evident in this view where Huniford’s custom sofa offers a contemporary take on a wingback juxtaposed with Josef Hoffman’s Viennese Secessionist chair from Kimcherova. 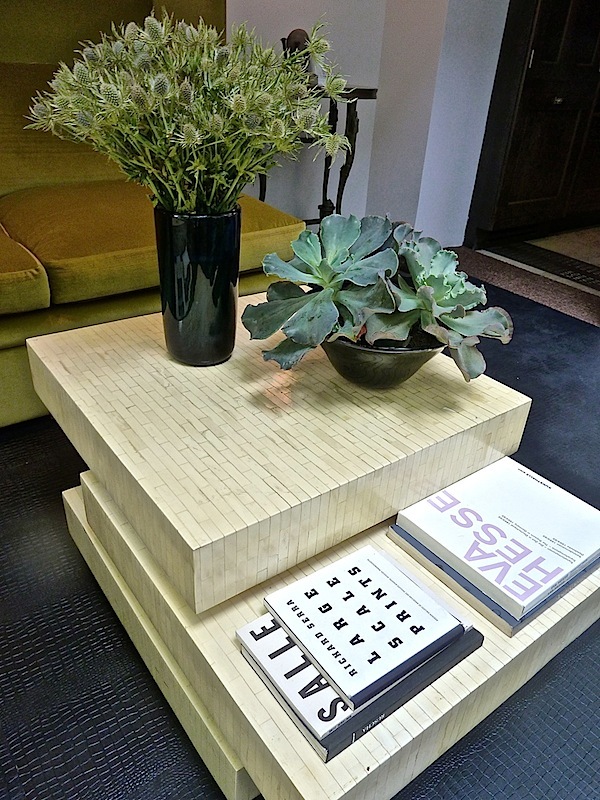 And Enrique Gracel’s fabulous ’70’s bone coffee tables from Mondo Cane, with their sliding tiers, loosens up the geometry from across the way. 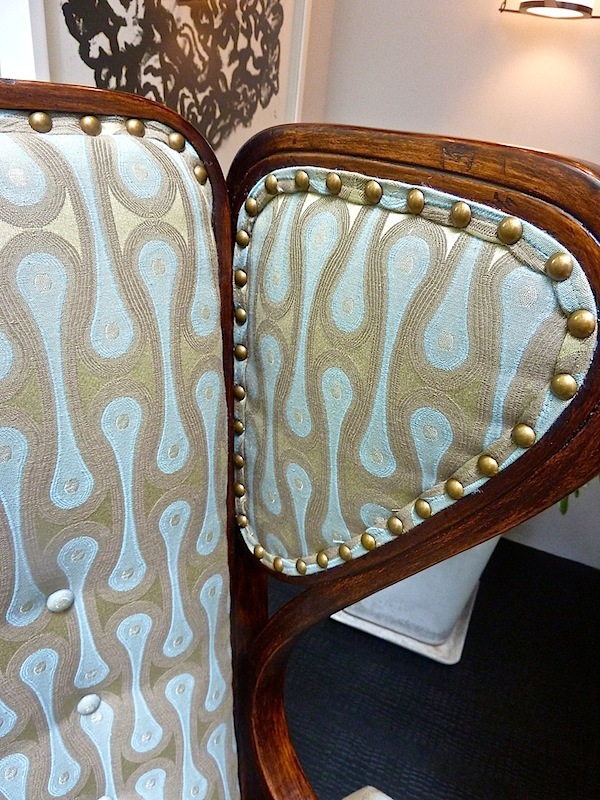 Here you can see the details of the bone construction in a lovely vignette. 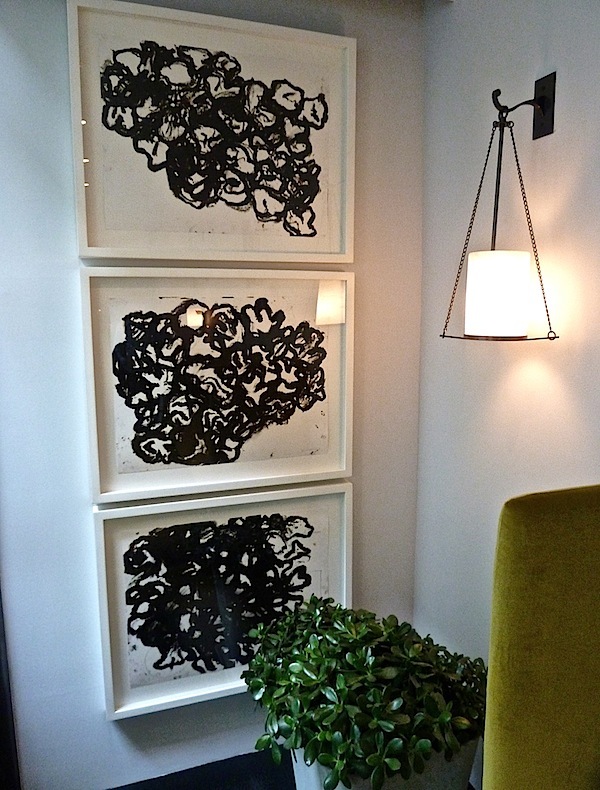 Every room can benefit from black accents as illustrated in this corner vignette with an organic series of drawings by Jannis Kounellis set against an architectonic custom metal sconce by Huniford. 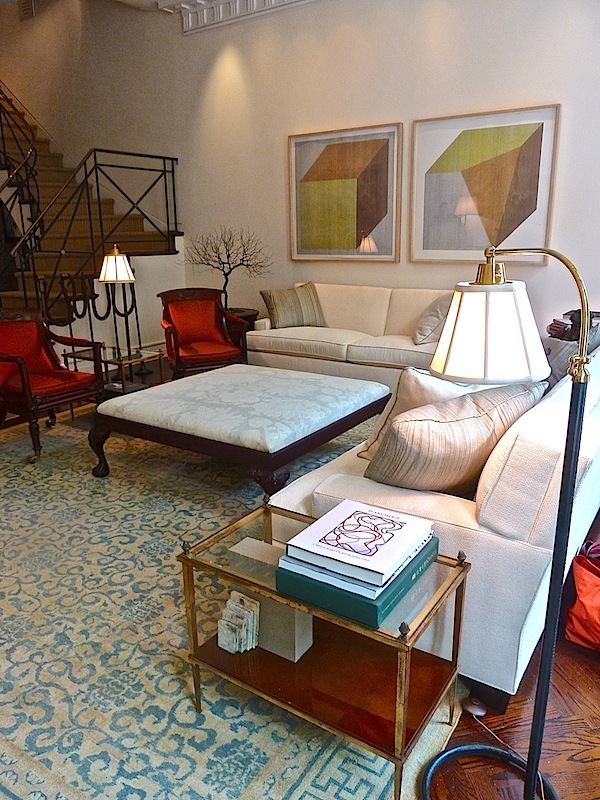 into Gomez Associates‘ elegantly neutral drawing room. A comfortable sitting room, it feels timeless with a polished eclecticism, mixing old and new with aplomb. A Lotus Chinese Carpet from Doris Leslie Blau anchors the room with classic Adnet floor lamps and a pair of large silkscreens by Sol LeWitt. 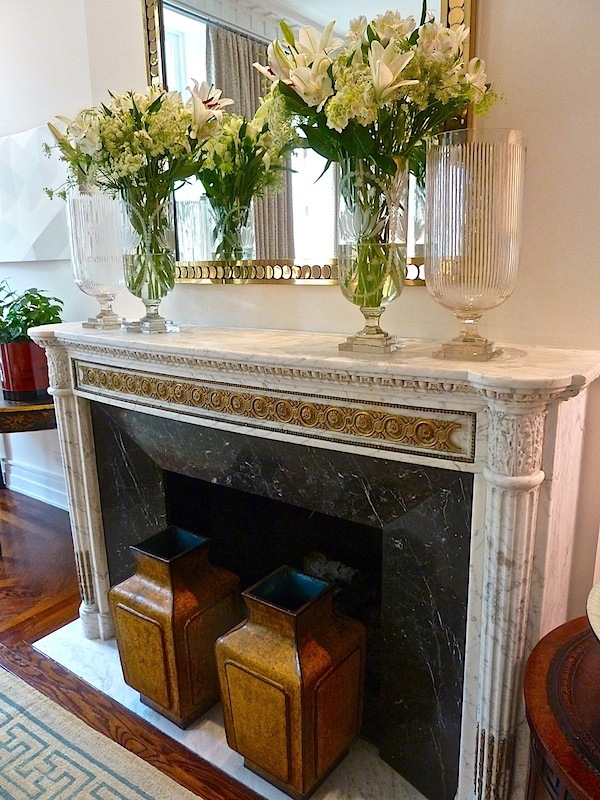 The original marble fireplace is graciously accessorized with vintage Chinese vases from Yale Burge, lovely etched hurricanes from Rosselli and a gilt brass mirror from Bernd Goeckler. 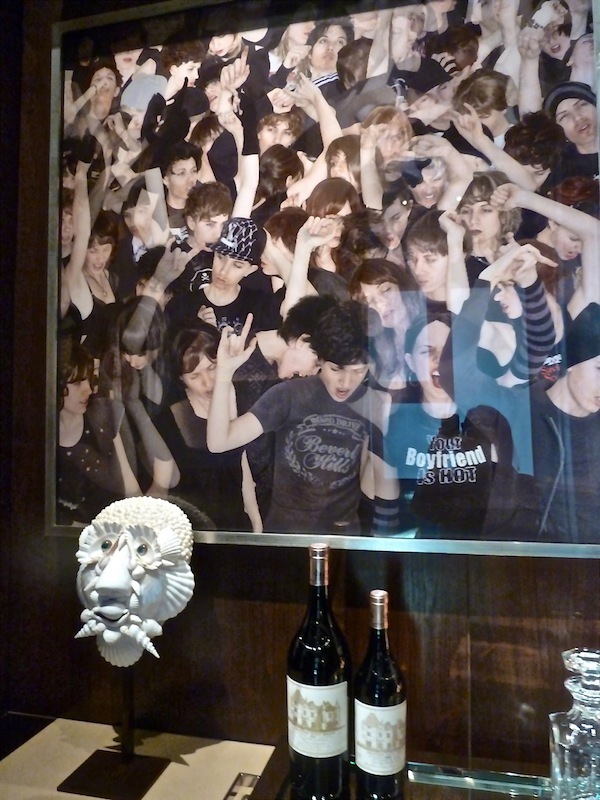 One of the most dramatic and creative spaces is Kristen McGinnis‘ moody dining room. Centered on a sculpture/chandelier by childhood friend, Elliott Hundley (courtesy of Andrea Rosen Gallery), the room took on a dark and artistic perspective. 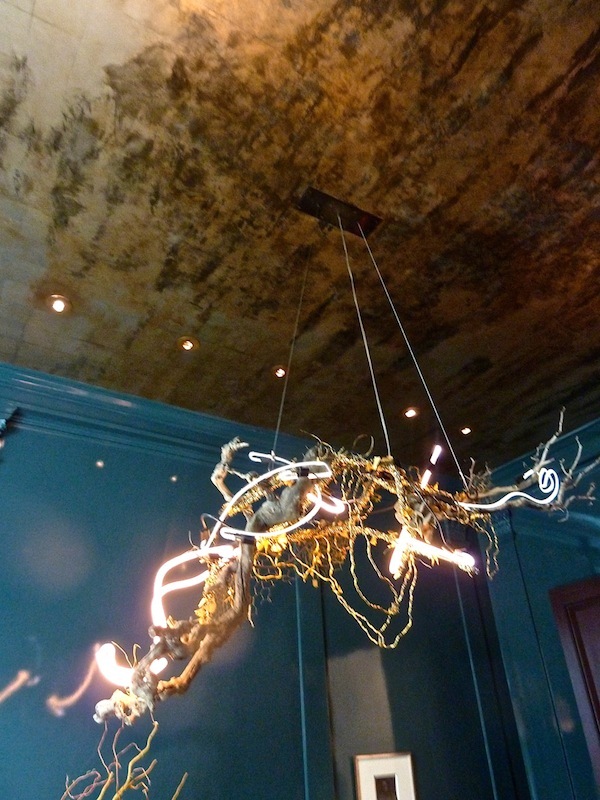 The ceiling is gold leaf by Maya Romanoff enhanced by painting and patination by Gotham Painting for added depth and effect. The table is set with the designer’s own vintage Jaune de Chrome plates paired with Toetsu Studio Japanese bowls for a deep and lustrous impact. 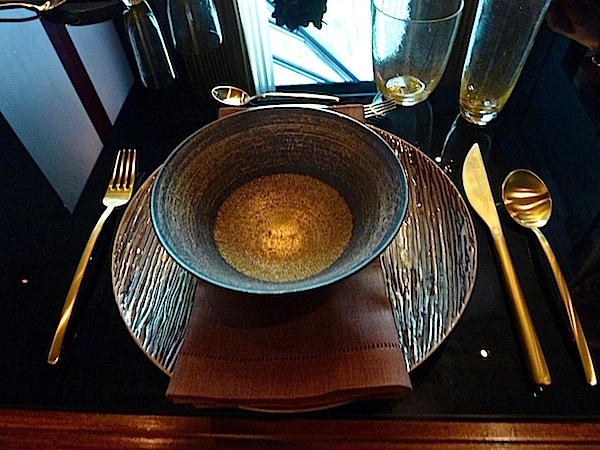 I’m normally not a huge fan of gold toned flatware but this Mepra Due “Ice Oro” set works beautifully here with a simple hemstitched Sferra napkin. Here you can see the rich mix of colors and texture. 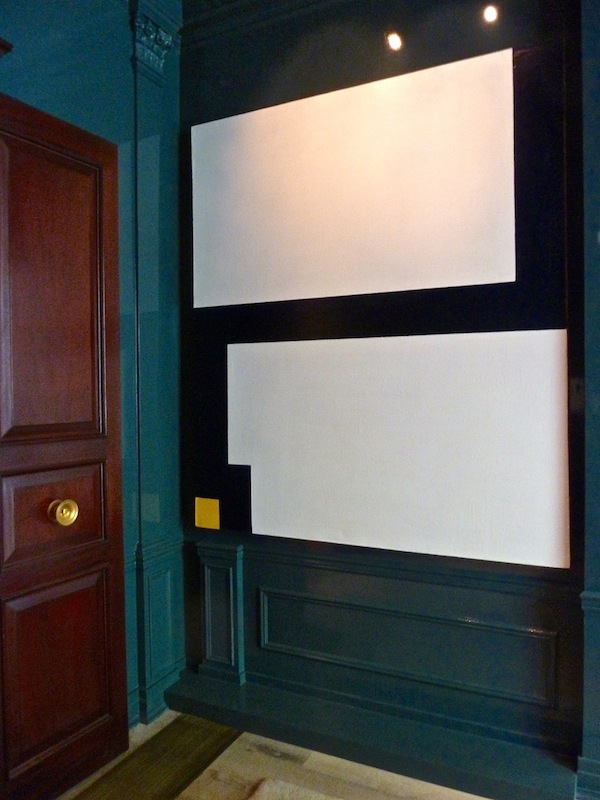 The gorgeous lacquer blue of the walls with the mahogany doors and Al Held graphic canvases. My favorite spot in the room, however, was at the balcony overlooking James Huniford’s atrium through to the garden beyond. 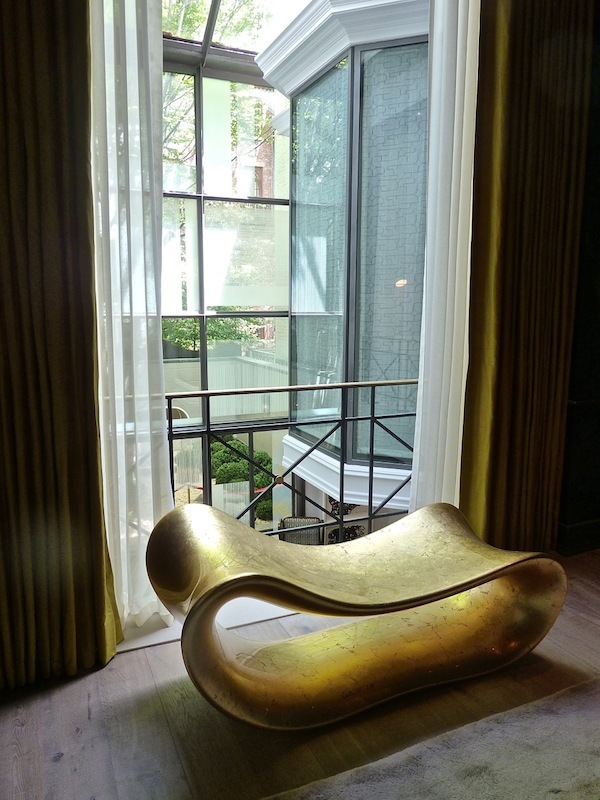 McGinnis artfully framed the view with a sinuous Wendell Castle bench and beautiful Claremont chartreuse faille. 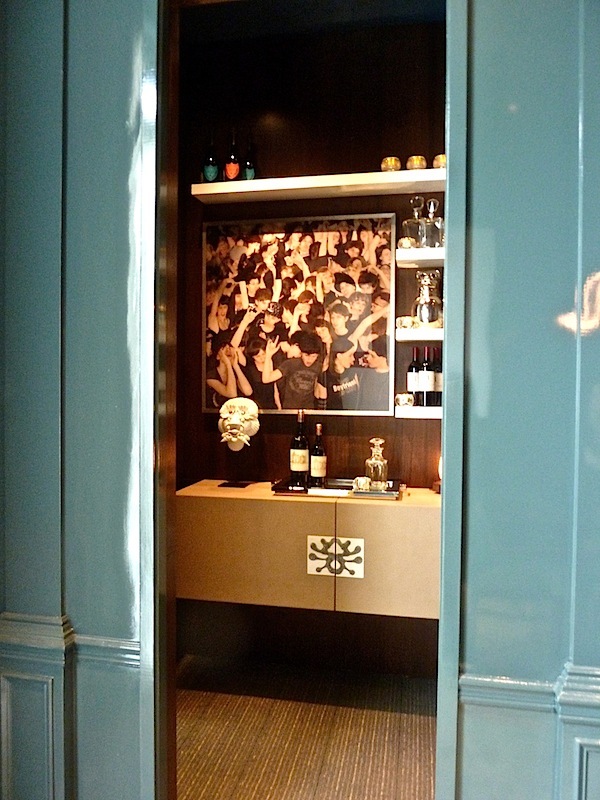 Through the lacquer entrance of the dining room Joan Dineen and Alyson Liss-Pobiner of Dineen crafted a sophisticated bar and wine tasting room. 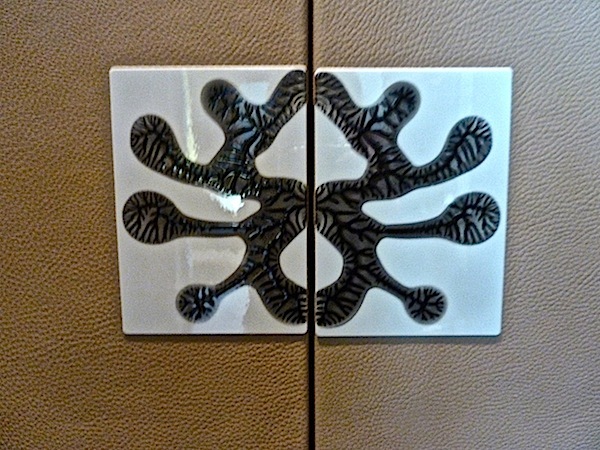 A photograph by Margeaux Walter sits over a leather wrapped cabinet with artisanal tile closure. The glass enclosed room is diffused by semi sheer textural drapes. 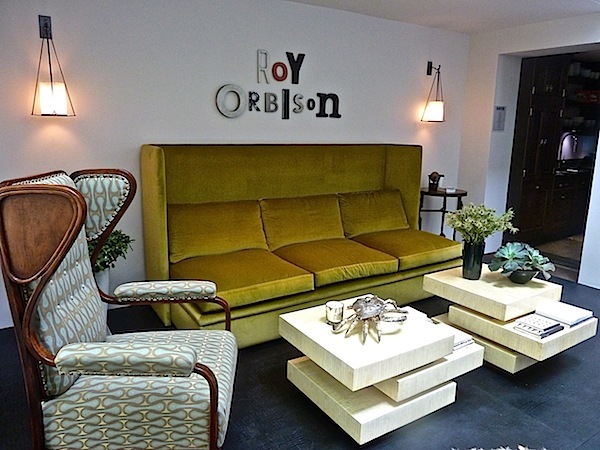 An eclectic group of furnishings is meant to evoke the cultivated taste and knowledge of the imaginary resident. 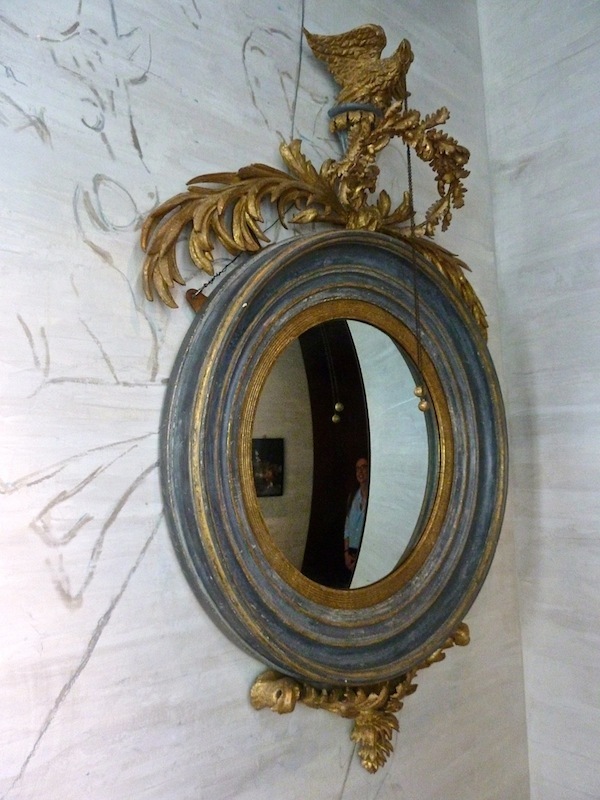 A regency mirror sits against mormorino plaster walls with designs of a celestial star chart and constellations as if drawn from a faded page of an ancient manuscript. 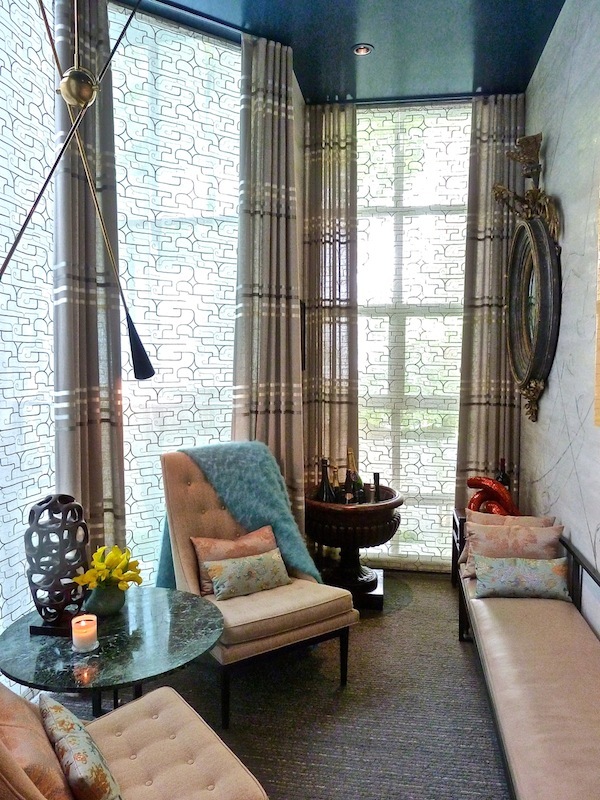 and an urbane mix of textiles and textures add a sensual sophistication to the space. 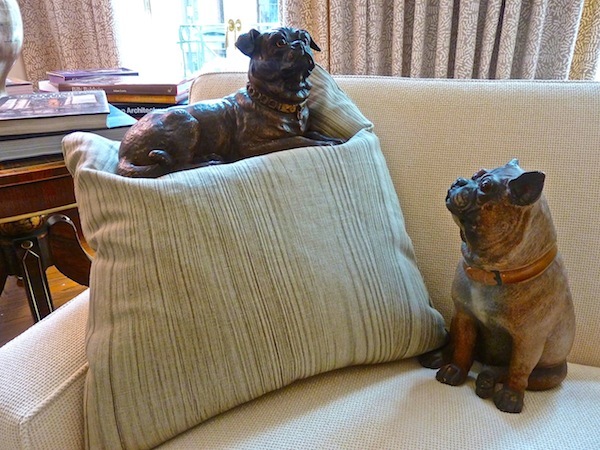 Stop back as we will continue to explore the Kips Bay Decorator Show House. This entry posted in architecture, design, interior design. 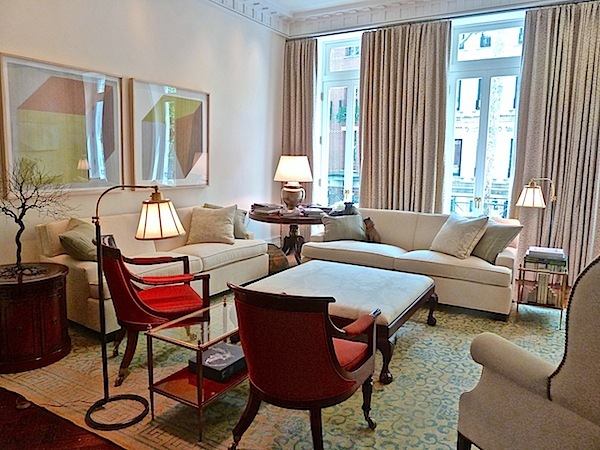 Entry Tags: Decorating, interior design, Kips Bay, Show house Bookmark the permalink. Love all the elements of surprise, that shell head is a riot on the bar and clever mix of materials and periods give it such a bygone era of sophistication that I simply adore. 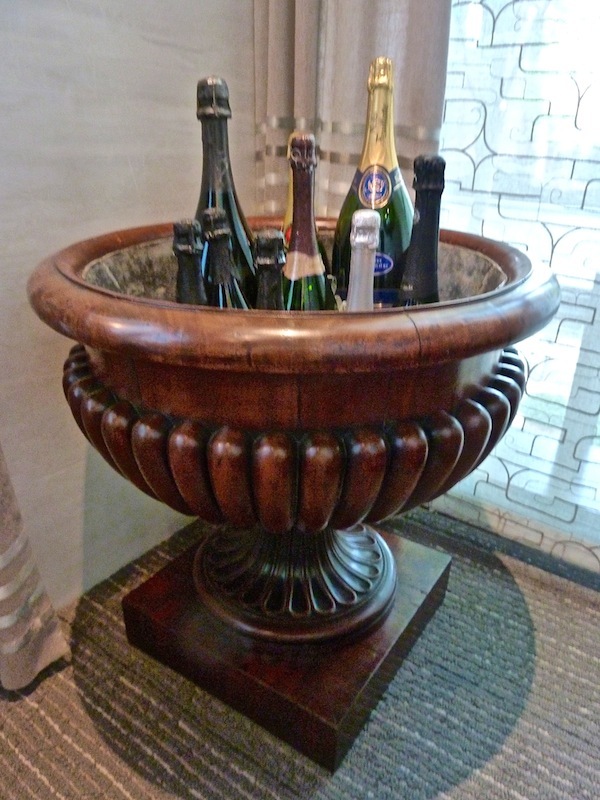 James Huniford always seems to get it pitch perfect–but the wine tasting room is where to look for me: the mix of textures and tones together with Regency and mid-century is perfection. 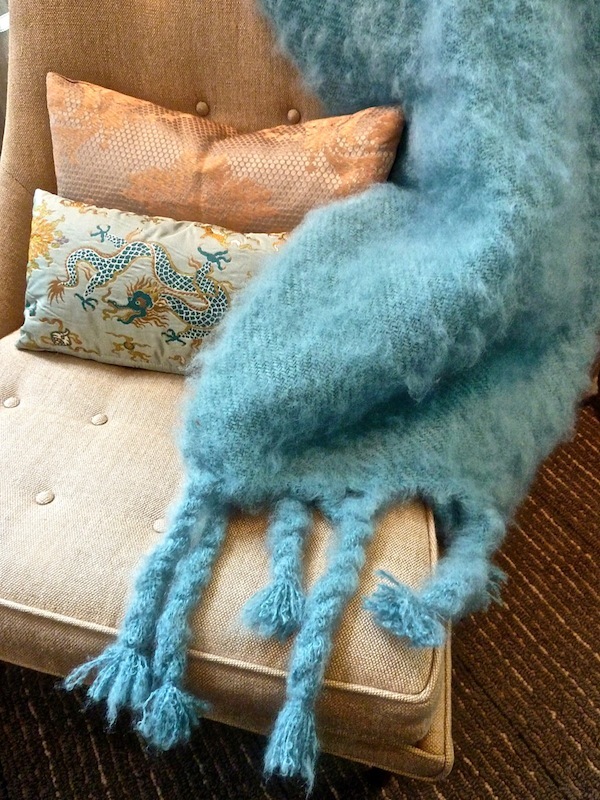 That turquoise throw pulls it all together. Any idea who’s floor lamp that is in the sitting room ? Hi Janet – as mentioned in the article, they are Adnet floor lamps and are available at Marvin Alexander. Well done all! I love this year’s showhouse. WOW! The ceilings in this show house were the stars. Wow – so many interesting and unique accents in these rooms. You must have been snapping away like mad. Love the view over the garden, as well, and you wouldn’t be able to tear us away from that Wendell Castle bench. 80 queries in 1.272 seconds.